Can I just say how much I love this? This concept of missing out on some things is something I’ve been working on lately. I’m trying to be more mindful of not majoring in the minors. I guess the old-fashioned term would be “prioritizing,” but somehow, the idea of making lists and prioritizing them always leaves me feeling guilty. The bottom of the list never gets done, and I’m always adding more and shuffling things around. It just seems like it’s impossible to really get traction when your life is a list. But this idea of just… letting go. 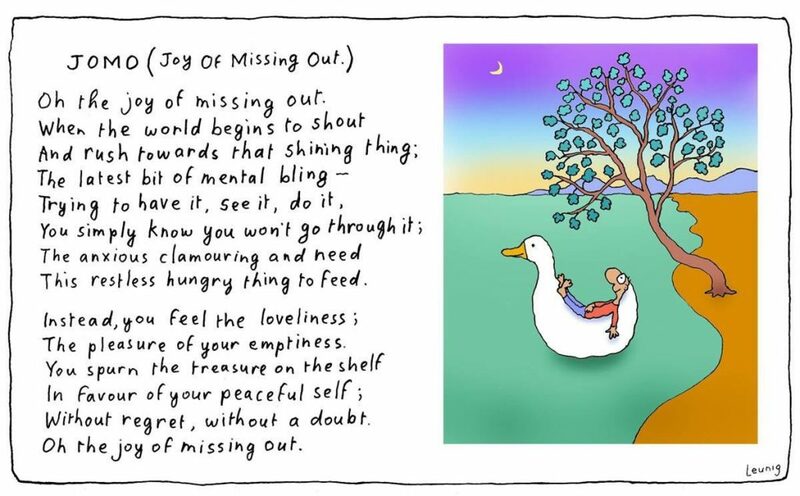 Missing out–and knowing that you’re going to miss out…. * The latest crazy news item that will be supplanted by another crazy news item in less than 24 hours. * The latest show that EVERYONE is raving about, but you likely won’t remember in a year. * The MUST READ book of the year that might end up being a footnote in literary history in 50 years. * The housework that can wait till tomorrow or next week or longer as long as people are fed, clothed, and sheltered. Stop. Breathe. Rest. Turn it all off, shut it all down, and just be quiet for a while. I’ve been struggling to find the words for Unquickened lately. Granted, it is summer, and my head is filled with the dulcet tones of bored children and the million demands and requests of same. And though scouting is now officially OFF my “to do” list*, we have been incredibly busy as a family with more busy-ness coming down the pike before September. And to top it off, summer is apparently trying to kill us this year, and I am not a sun worshipper, to say the least. Still, I firmly believe that one of my biggest struggles is finding space to quiet my brain and give creativity space and time to breath, roam, cavort, explore, and… well, create. This big old wide world turned on its axis just find for millions of years without me. It will turn on its own for an hour, a day, a week if I check out and rest. And look–the truth about the craziness is that if I really miss it, it’s not that hard to step back in. I will endeavor to major in my majors–whatever those are–and let other people major in their majors. And once in a while, I will actively miss out on something and choose quiet.